Faithful gathered at the gates of MU in prayerful protest. On December 17, TFP Student Action volunteers went to Dallas, Pennsylvania to protest Fr. James Martin's commencement address at Misericordia University, a Catholic campus run by the Sisters of Mercy. Dozens of local Catholics showed up to pray in peaceful protest, lining the main entrance of the campus to alert others about the Jesuit priest's erroneous position in favor of homosexuality and transgenderism for children. Weeks before the Winter commencement, TFP Student Action gathered more than 23,000 signatures addressed to Dr. Thomas J. Botzman, Ph.D., president of Misericordia, urging him to "find a new speaker who respects and loves the perennial doctrine of the Catholic Church." Parents whose children study at the Catholic university were especially scandalized by Fr. Martin's pro-homosexual statements and did not want the priest to mislead young Catholics into error. In his latest book, Building A Bridge, Fr. Martin attempts the impossible, to mix good with evil, to reconcile the homosexual movement with Catholicism. Neverthless, university leaders, brushing parental concern and Catholic identity aside, embraced political correctness and refused to cancel Fr. Martin's address. 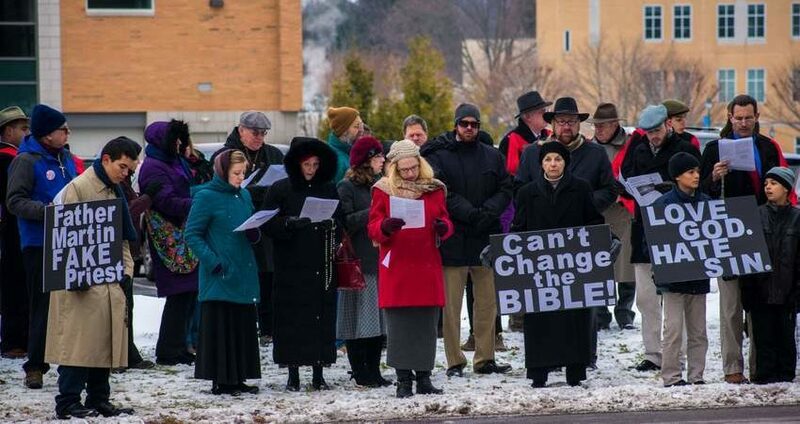 The TFP petition alerted and galvanized many who came to pray and protest at the gates of the university. Their public display was visible. And everyone arriving for the graduation saw the large throng of about sixty faithful Catholics praying the rosary and holding signs and banners that read: "Love God, hate sin," "Fr. Martin fake priest," and "We protest Misericordia speaker Fr. Martin's promotion of homosexual sin. Reparation! Reparation! Reparation!" After reading the signs and banners, many reacted favorably with expressions of support. But one screamed, "You're ruining my graduation. You're all going to hell." The public opinion divide ran deeper than Fr. Martin's pick as commencement speaker. There was a clear split between those who love God's law and family values versus those who support the homosexual revolution and its anti-family agenda. As the peaceful protest ended, America Needs Fatima director Robert Ritchie exhorted those present to continue to defend the honor of Holy Mother Church and the law of God: "Do not give up or give in to discouragement, because Our Lady of Fatima already predicted a hundred years ago that she will triumph."